Top this Frozen Berry Dessert with mixed berries for a pretty special occasion treat. 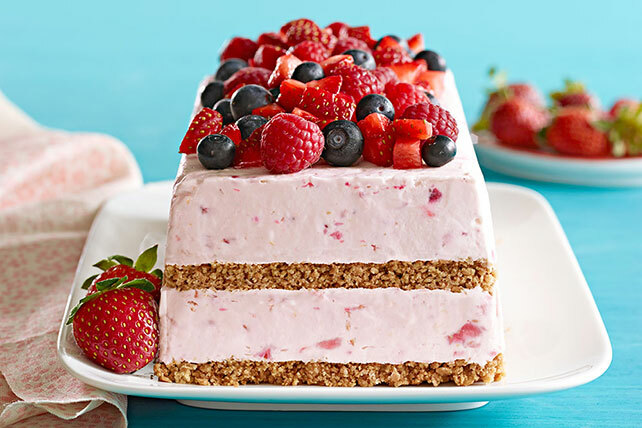 This Frozen Berry Dessert makes enough to feed a crowd. Mash 1/2 cup each strawberries and raspberries in medium bowl. Beat cream cheese spread in large bowl with mixer until creamy. Gradually beat in milk. Blend in melted chocolate, mashed berries and zest. Whisk in COOL WHIP. Spoon half the cream cheese mixture into plastic wrap-lined 9x5-inch loaf pan; top with half of the crumb mixture. Repeat layers. Freeze 6 hours or until firm. This frozen dessert makes enough to feed a crowd so it is perfect for a special occasion.